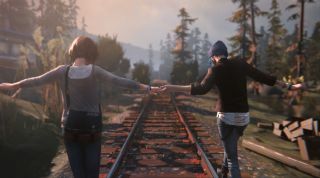 The season finale trailer for Life is Strange has been revealed, ahead of its release tomorrow, though be warned that it's quite spoilery if you haven't played the previous episodes. You can check it out above, though if you haven't played the first four episodes then you might want to steer clear. It's mostly a recap of events so far, accompanied by swelling music and Max talking about the end of the world. Has Max 'changed too much destiny'? We can find out tomorrow. The series so far has been widely praised: you can find our ode to the first four episodes here. I haven't been quite as taken with Life is Strange, though I'm intrigued to see how it resolves—as much as time travel plots ever can. The series deserves credit for not pulling its punches, though whether it fully earns the right to play with the subject matter is up for debate. There are times where it handles the relevant issues exceptionally well, and times where similar issues are used for shock value. Still, If you don't mind a bit of tonal inconsistency, it's definitely worth a look.